Mushroom Gorge is the third course in the Mushroom Cup from Mario Kart Wii. The course is located on a mountainous zone with tall mushrooms rising over cloudy pits, where racers have to use some of them as platforms to pass certain gorges. Characters travel the course mainly on land; however, in a part of the route, they enter a cave where they find a pit full of mushroom platforms. Players can drive two different ways over these mushrooms to cross the cave. Red mushrooms cause drivers to bounce, so players can do a trick while they are in the air to get a small boost of speed later. The green-capped mushrooms, however, do not cause vehicles to bounce. Some Goombas appear serving as obstacles on the track. Mushroom Gorge reappears in Mario Kart 7 as a retro course of the Shell Cup. The course's layout shows some changes from its first appearance, including a blue-colored bouncy mushroom for the gliding function, the removal of two mushrooms at the beginning of the course, and Giant Goombas at the end of the track. The track begins on a dirt road. There is a slight turn to the right and another to the left, which brings to a wooden bridge that turns right. After that, there are Item Boxes for the player to take. After them, there is a single red mushroom that the player can use a trick on to gain a speed boost. Before this mushroom, other mushrooms can be seen. In between the bridge and the dirt road is also an abyss the player can fall into. After the mushroom is a left turn in which the player has a choice to take the longer, but safer path with Item Boxes and Dash Panels or the more dangerous, but shorter path with mushrooms (The one CPU players usually take). After this is an entrance to a cave, in which the road turns left and into an abyss with mushrooms all over. 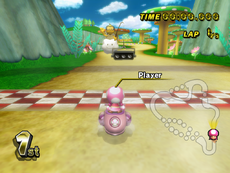 The player also has two paths to take, and both involve the use of the mushrooms in the track. One path on the right is normal while the one on the left takes the player to a greater height. Both paths have green mushrooms, red mushrooms, and item boxes for the player to use and there isn't much of a time difference between them. After the mushrooms is the end of the cave and the last turn, which is a left U-turn around an abyss. Goombas are on this part of the track, helping the player by releasing mushrooms or hindering the player by acting as an obstacle. After the Goombas is the finish line which starts another lap. In Mushroom Gorge, there is a shortcut that allows the player to speed past the regular curving route and get a boost. It can be performed without a mushroom (by jumping over the thinnest part of the grass and turning slightly right after bouncing off the first mushroom) and is recommended for Time Trials. After starting the race, the player should head to the left through an area with no fence and use a mushroom boost (or jump) to drive off the cliff and bounce off the mushroom below, landing on the bridge. This shortcut was responsible for Mushroom Gorge becoming infamous as the site of the "Mushroom Gorge Glitch": where racers turn around and bounce off the first mushroom and lean back to climb on the wall. Moving left for a while then drops the player onto the track before the finish line. Because of this, the deliberate shortcut and two mushrooms were removed in Mario Kart 7. Also, by the last U-turn, if the player cuts across the grassy patch with some sort of speed boost and doesn't fall into the crevice, there is a time gain of a second or two. Players can also use a mushroom and jump across the gap itself. It is also possible to bounce off the final mushroom on the left side of the cave and climb on the left wall and get onto the other side of the gap; a mushroom is required. In Mario Kart 7, this can be done with the glider, but is much harder and costs time. Whether intentional or not, hitting a jump boost with allow the racer to drive and drift off-course without losing speed. This status is removed after bouncing off a mushroom. "Bouncing and pulling tricks off the red mushrooms is crazy fun, but it's tricky to keep your car out of the chasms." "Bounce your way through an underground cavern on top of giant mushrooms that double as trampolines. Whatever route you take, just make sure you land safely!" Guide: "This is the first course to offer a multitude of tricks, as well as precarious edges and bottomless drops to avoid-or jostle your opponents into! The trick here is to figure out the quickest route when the course branches into two different paths, all the while avoiding the roaming Goombas, staying on the dirt track, and using the famous giant mushrooms as trampolines!" The second tournament of June 2008 was a Time Trial of Mushroom Gorge. However, the course had to be driven through backwards. Ramps were added to the beginnings of the mushroom paths (or else it would be impossible to land on them without falling off). The same tournament later appeared as the second tournament of June 2010, the first tournament of December 2011, the second tournament of February 2013, and finally the only tournament of May 2014, the final tournament before the discontinuation of Nintendo Wi-Fi Connection service. This track reappears in Mario Kart 7 as the third race in the Shell Cup. The mushrooms are larger than in Mario Kart Wii, and they are flat. Some mushrooms in the background have been removed. The arrows at the first split paths have been changed to red from brown. There is an added Dash Panel in the first split track section. The Dash Panel on the right at the split paths has been moved forward. Giant Goombas replace the normal-sized Goombas. The Dash Panels before the mushrooms can wash away Bloopers' ink when driven on. The shortcut at the beginning of the track with the two mushrooms has been removed. Five red mushrooms in the cave have been removed. The green mushroom on the left side in the cave has been changed to a blue mushroom which activates the glider. Toad replaces Toadette as the staff ghost data for the course. The background music for Mushroom Gorge is available as a track that can be heard on the Mario Kart 8 stage Mario Circuit, in Super Smash Bros. for Wii U and Super Smash Bros. Ultimate. This page was last edited on March 18, 2019, at 19:41.